So it's the last month before the close of the season. 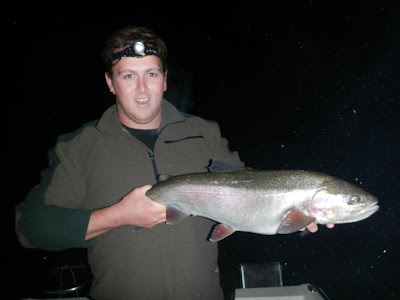 Some awesome fishing to be had for those wanting to get out amongst the cold. Plenty of aggressive pre spawn rainbows and big browns are kicking around. It's your last shot to hit any headwaters so make sure you get you get out and give it a nudge. Also, boat access to our favourite lakes is about to close and the fishing is good. Some really impressive fish are being caught in shallow water and these fish are generally in great condition. I've not log got back from a little trip to Tarawera where smelt flies were still doing damage but casting a globug when you are parked up cooking your lunch is always worth a shot and this is how the bigger fish can be targeted. Here is the best my mate Mark picked up from that trip. Also, for this time of year the new Montana Fly Company hip flasks from Manic Tackle Project are essential. When the fishing is slow in the cold weather there is always the comfort of hard liquor to warm the insides.